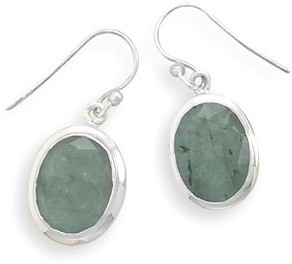 Rough cut faceted emerald earrings in sterling silver. Emeralds measure 10mm (3/8") x 14mm (9/16"). Earrings measure 31mm (1 1/4") x 11mm (7/16") including bale (20mm without). We guarantee our Rough-Cut Oval Emerald Earrings in Sterling Silver to be high quality, authentic jewelry, as described above.